This page compares photoresistor vs photodiode and mentions difference between photoresistor and photodiode. It covers advantages and disadvantages of photoresistor and photodiode. • It is a passive component which varies its resistance in response to the light. • It is a disc shaped component with two leads as shown in the figure-1. • When the light falls on the surface of the disc, resistance between the leads diminish (or reduce). In darkness, resistance as high as 10 MOhms and in bright light, resistance as low as 500 Ohms can be achieved. • It is a passive component with no polarity. • It represents equal resistance in both the directions and it can be used either with AC or DC. One of the applications of photoresistor is shown in the following circuit. Here it acts as variable resistor based on light intensity falling on it. The resistance of a photoresistor decreases with increasing incident light intensity. In other words, it exhibits photoconductivity. There are various circuit symbols of the photoresistor. Photoresistors of various sizes are available ranging from smaller one (5 mm in diameter) to larger one (25 mm in diameter). It can be used to generate variable voltage. A photodiode is a type of photodetector capable of converting light into either current or voltage. The device operates in reverse bias and electric field developed across the p-n junction sweeps the mobile charge carriers to their respective majority sides. Hence a depletion region is formed. This barrier stops the flow of majority carrier and supports the flow of only minority carriers and hence leakage current flows. 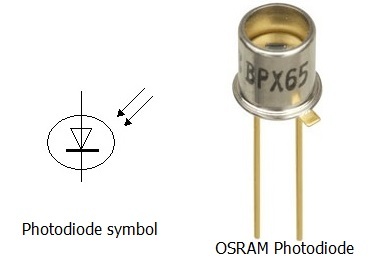 The figure depicts photodiode symbol and one such part from OSRAM. Following table mentions difference between photoresistor and photodiode. Directional No, Photoresistor is sensitive to incident light from anywhere in front of it. Yes, Photodiode is sensitive to incident light from particular direction and insensitive from other directions.